Fru-Gal.org: IHOP: Kids Eat Free for the Entire Month of April! IHOP: Kids Eat Free for the Entire Month of April! This may be a terrific deal for a family meal out if you have a large family (or even a small one for that matter)! 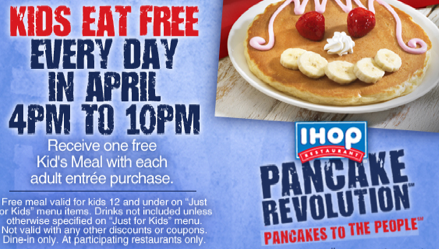 IHOP has a promotion throughout the entire month of April where with every purchase of an adult entree, you receive one free kid's meal, between 4pm-10pm. No coupon necessary. This offer is valid on the "Just for Kids" menu items, dine-in only, for children 12 and under.